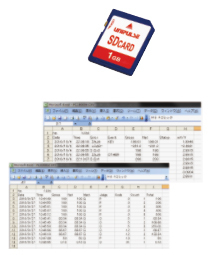 You can write and read setting parameters from SD cards, while recording weighing results & data when abnormalities occur. You can identify the indications of faulty load cells and replacement timing. Date & time of errors occurred can be displayed, as well as the record of how the errors are made (through key control, communication, I/O, etc). Monitor management of raw material, equipment operation rate and so on. Long-term trend can be observed as well. ・You can copy setting parameters to another replaced FC1000. ・Multiple FC1000s can use the exact same settings. ・You can restore the initial setting when you first install FC1000. (It will be saved as initial value separately from the setting parameters). Miniaturization of control panel & panel space saving. With combination of low pass filter (0.1 to 300Hz) which corresponds to various vibration and moving average filter (OFF, 2 to 512) that is effective for periodic vibration, automatic searching for optimal value with accuracy and stability can be achieved. (You can manually adjust settings too). High-pressure liquid filling & powder feeding can be done. By placing the rubber seal when mounting on the panel, the front panel can be protected from moisture and dust damage. High performance digital low-pass filter can be adjusted at 0.1Hz increment. 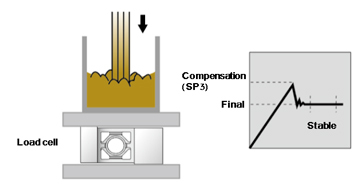 As it is resistant to vibration, measurement can be　performed quickly and precisely. The batch weighing with a low capacity scale enables the fast and accurate measurement of larger total weight. The sub display can be used to show the cumulative weight, code/preset number, etc…. 32 different weight settings can be saved in the memory and selected through I/O or interface. 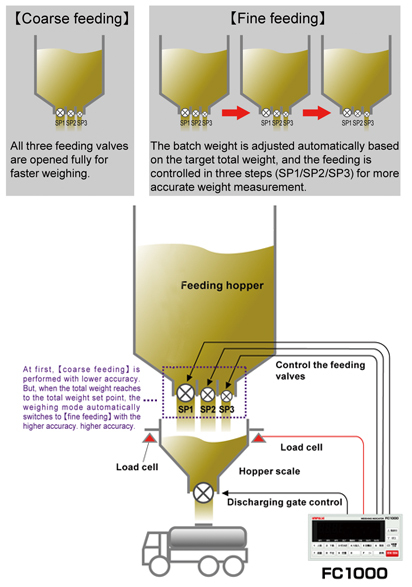 Batch weighing can be performed easily. Speed: 300 times/sec., 1200 times/sec. 1, 3, 6, 13 or 25 times/sec.